Mickey Mouse and his famous pals (Minnie, Donald, Pluto, Goofy and Daisy) join efforts to inspire preschoolers around the country to enjoy the outdoors by camping, fishing and exploring nature in the their DVD release of, Mickey Mouse Clubhouse: Mickey’s Great Outdoors. Just in time to kick off the summer, Mickey Mouse Clubhouse: Mickey’s Great Outdoors features four episodes from the “Mickey Mouse Clubhouse” TV show plus one all-new, never-before-seen “Mickey’s Fish Story” episode and comes packaged as a special DVD Play Set (DVD + Digital Copy + Mickey Mote). The Mickey Mote (a child-friendly handheld remote control) provides hours of interactive fun that allows kids to engage with their favorite Mickey Mouse Clubhouse characters while watching Mickey’s Great Outdoors. Mickey Mouse Clubhouse has become a morning tradition in our home, our children LOVE to watch it every morning on The Disney Channel! Although it's available for them to watch daily on The Disney Channel, they also like to watch it when we're on long car trips and as a special treat, sometimes they get to watch it on DVD in the evenings. As a mom I love that it offers learning opportunities and encourages kids to interact by asking questions throughout the episode (having the kid's follow along with the Mickey Mote is wonderful as well~it's a great interactive tool!). Being the big fans that they are, they were excited to kick off the Summer season by watching the fun episodes on Mickey's Great Outdoors. They had a blast watching their pals from Mickey Mouse Clubhouse navigate the outdoors and embark on some of the fun adventures that they're looking forward to having themselves this Summer! 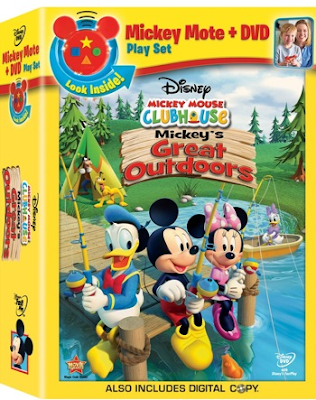 With a bonus never-before seen episode and the included Mickey Mote, Mickey Mouse Clubhouse: Mickey's Great Outdoors DVD Family Fun Pack offers up TONS of interactive educational FUN! Welcome Summer with Mickey Mouse Clubhouse: Mickey's Great Outdoors! You can find it on DVD online and at retailer's near you on Tuesday, May 24, 2011.